Imagine that you are in charge of a project. You have been asked to create App X that accomplishes Y. This is your first project and you want to do it right. You have heard good things about using Agile Scrum, but don’t know anyone else who has used it successfully. You are strong-willed, though, so you do it. While searching for resources, you come across “Agile Scrum: Your Quick Start Guide with Step-By-Step Instructions” by Scott M. Graffius and decide to give it a shot. You find that by just using the guide alone, there are sections that confuse you. Why is that? If you are an experienced project manager, you’ve probably heard of or used Agile Scrum before. Many project managers use it on a daily basis as a method for completing projects in an organized, effective way. 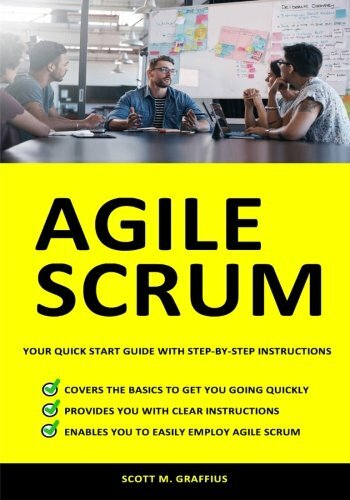 For people who have used Agile Scrum and simply need a refresher or a place to grab a needed piece of information, this guide may work well for you. On the other hand, if you, like our imaginary protagonist, are approaching Agile Scrum for the first time, you are probably looking for a way to jump right in so you can get started. In this case, you may find that the author takes this very complicated process and consolidates it into 10 easy to read sections with lots of pictures and few words. Depending on your Agile Scrum experience level, however, this could be a problem. One may think that since there are lots of pictures with few words that this would make the process easier to understand. As a new Agile Scrum user myself, the steps seem to be laid out in a way that is easy to understand; however, as I read and tried to understand the directions, I felt something was missing. There seemed to be a small piece of the puzzle that I just was not getting. Finally, it clicked for me as I read the Agile Manifesto in the Appendix - I needed context for using this method. If you have this book and are new to Agile Scrum, the Appendix will be a lifesaver for you. It contains a brief history of how Agile Scrum developed and its purpose. You will learn the purposes of Agile Scrum and in small ways why it functions as it does. You will learn a little of the difference between Agile Scrum and the traditional method of project management, but don’t expect the author to fill in the gaps—he expects you to have a strong understanding of what that traditional method is in order to understand the comparison. As noted in the title, the book functions as a quick reference guide. If you want more information, you must use the Appendix. As far as the depth of information in the guide, I will use the “Story Points” game as an example. In section 4B, Graffius describes the Story Points game. From what I can tell, this seems like an important aspect of the Scrum process. Here is how the author describes it: “For planning, the Product Owner obtains high-level initial estimate of the complexity of items in the product backlog. That information helps to inform decisions on priorities” (p. 33). If you are looking for how you may use the information derived from this game, you will have to look elsewhere—the author focuses solely on the process, leaving exactly how this might benefit you to your imagination. That said, if you are new to Agile Scrum, you will need to review the Appendix first to really learn what each section means. Without this information, Agile Scrum just doesn’t make sense. Additionally, the appendix provides more detailed Agile Objectives and an Overview that will better help newbies like me to understand the purpose of Agile Scrum. The book itself is exactly what it claims to be on the cover. It is simply step-by-step instructions for using Agile Scrum. As far as recommending “Agile Scrum: Your Quick Start Guide with Step-By-Step Instructions” by Scott M. Graffius, if you are already familiar with Agile Scrum, but need a quick reference, this book may be of help to you. If you are not familiar with Agile Scrum, I recommend that you seek out one of the many books that go into much more detail on what Agile Scrum is and how to properly implement it into your workplace. This may make a good companion piece to one of those.